Trained as metalsmiths, Lisa Gralnick and Venetia Dale use ceramics to produce hybridized objects that merge sculpture, design, and craft sensibilities. Both artists share a deep interest in material culture and the manner in which the function and meaning of an object shifts through exchange, time, and use. The title of this exhibition refers to the fact that Gralnick and Dale have known each other for over ten years, since Dale first studied with Gralnick in the metals studio at the University of Wisconsin-Madison. Their lives and work are linked by their shared interests and choice of media, as well as a friendship that transcends the mentor/student relationship. Two Generations, One Dialogue explores the way globalism, shifting borders, and the incongruity between place of production and place of consumption have produced objects with increasing layers of meaning and complex relationships between material, process, and design. As cultural signifiers are absorbed, transformed, and pieced together, a commodity culture has emerged that is both far more eclectic than at any time in history. Yet the distinctions between design from different parts of the world are less apparent and well-defined than before. A whole host of everyday objects now look precisely and disconcertingly the same across the globe. Gralnick and Dale approach this phenomenon from different positions. While Dale's work deals with mass-produced goods as complex assemblages, Gralnick is more interested in the idiosyncratic object. Lisa Gralnick is known for her intellectually rich investigations of gold as an artistic medium and a precious commodity. Her recent work in ceramics references the luscious, elemental surface of wet clay through the use of terra sigillata, a refined slip with a soft, skin-like sheen. Juxtaposing meticulously hand-modelled renderings of familiar objects—particularly tools, instruments, and machines—with similarly modeled and surfaced abstract forms, Gralnick’s work posits the loss of our material culture’s specificity and distinctness. Many of the works reference obsolete goods that, having been stripped of their original functions, exist in the present strictly as aesthetic objects and evocative souvenirs. Gralnick will also be exhibiting a series of gouache “portraits” of her ceramic works, transmuting them into yet another medium of meaning and value. 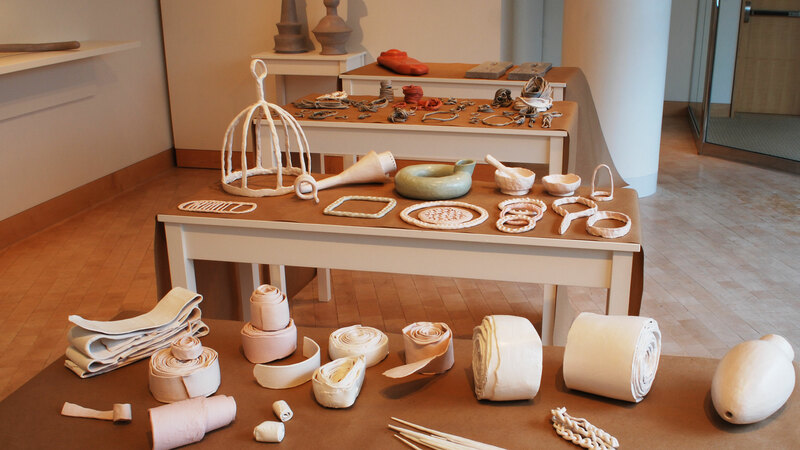 Venetia Dale's current work is made by re-presenting functional objects by molding and casting them in clay, and assembling the re-materialized parts. The sculptures emphasize the patterns, imagery, and forms of the original materials, while subverting their intended function to invent new possibilities for these mundane and overlooked objects. These large collections of smaller forms maintain a collective gesture common to objects that have been stacked, piled, placed and stored. They are experienced as familiar and distant objects, and point toward the greater connections that our globalized material culture presents. Both women are profoundly skilled metalsmiths with national reputations as artists; both also earned their MFA degrees at the State Univeristy of New York-New Paltz: Gralnick in 1980 and Dale in 2009. Lisa Gralnick is currently Professor of Art at UW-Madison and Venetia Dale is teaching at Massachusetts College of Art and Design in Boston, MA. Image: Venetia Dale, Breakbulk, 2013. Vitreous clay, 30 x 26 x 42 in. Venetia Dale is a metalsmith and sculptor whose work explores shifts in utility, mobility, and exchange between people, places, and things. Dale received her MFA from the State University of New York at New Paltz in 2009 and her BFA from the University of Wisconsin-Madison in 2004. Although there were no artists in Lisa Gralnick's family, she was exposed to art at a very young age and attributes her analytical mind and precise mechanical skills to her father.